This is a classic Spanish combo that I’m equally happy eating for breakfast with a poached egg as I am having it for dinner on its own. You might be surprised to see ketchup as an ingredient but it really adds a lovely hit of tomatoey sweetness that is hard to beat. Although if you prefer a sugar-free option, see the variations below. 1. Heat a little oil in a frying pan. Add onion and cook over a medium heat for about 5 minutes or until starting to soften. 2. Add chorizo and cook for another 5 minutes or until the chorizo is well browned. 3. Add beans and ketchup and cook, stirring until everything is hot. Taste. Season with salt. Serve with baby spinach on the side. Wine Match: A spicy Tempranillo. 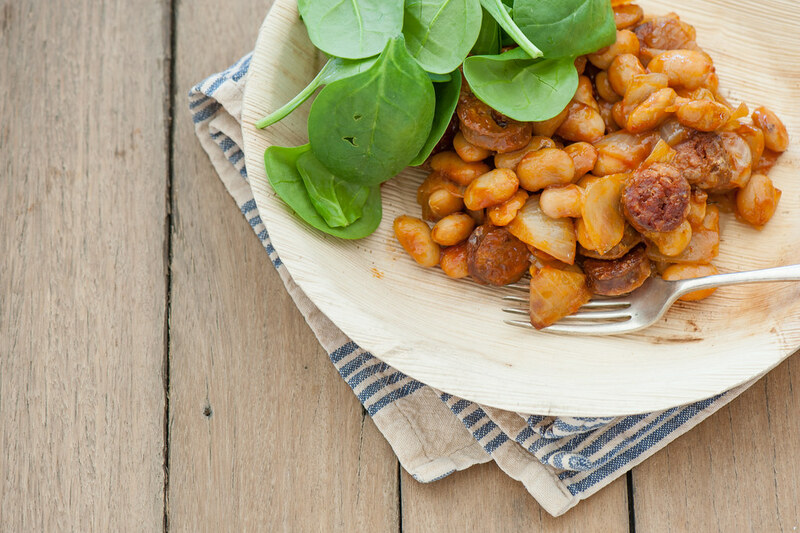 vegan – replace the chorizo with 1-2 teaspoons smoked paprika and increase the amount of beans and ketchup. vegetarian – replace chorizo with 1-2 teaspoons smoked paprika and serve beans with 1-2 poached eggs per person, or try replacing the chorizo with sun dried tomatoes and some crumbled feta. sugar-free – replace ketchup with 2-3 tablespoons tomato paste and 2 tablespoons butter. different meat – feel free to replace chorizo with any spicy (or mild) sausage or chunks of bacon. different legumes – I love butter beans or cannellini but you could use chickpeas, black beans, red kidney beans, or any lentil. Home cooked beans are even better, you’ll need about 250G (9oz) drained cooked legumes. more substantial / carb lovers – double the beans and ketchup or serve with warm flat bread or tortillas. Or serve beans on hot buttered toast. more veg – add grilled red peppers, eggplant, zucchini or cherry tomatoes. This will be dinner tonight! Just back from Barcelona with chorizo in my suitcase!!! !